Today we have the last of the Trudy paper dolls. I haven’t yet decided what I should do for my next short run doll. I’ve been combing through by own old file folders of paper dolls looking for things I can post and for things which are nearly done and it would only take a little work to make them totally usable for the site. It is neat to see how my own art has improved and how my style has changed. The more I learn about the comic paper dolls that inspired Trudy, the more impressed I am by the artists. A few of my favorite Katy Keene paper dolls are the ones in neat poses that you wouldn’t expect to see a paper doll in. Also you can find Katy on a horse. You can tell Bill Woogon, the artist, was having a lot of fun with these. Maybe someday I’ll have the nerve to draw a paper doll in a strange pose though I think if I do, she wouldn’t be on a horse. 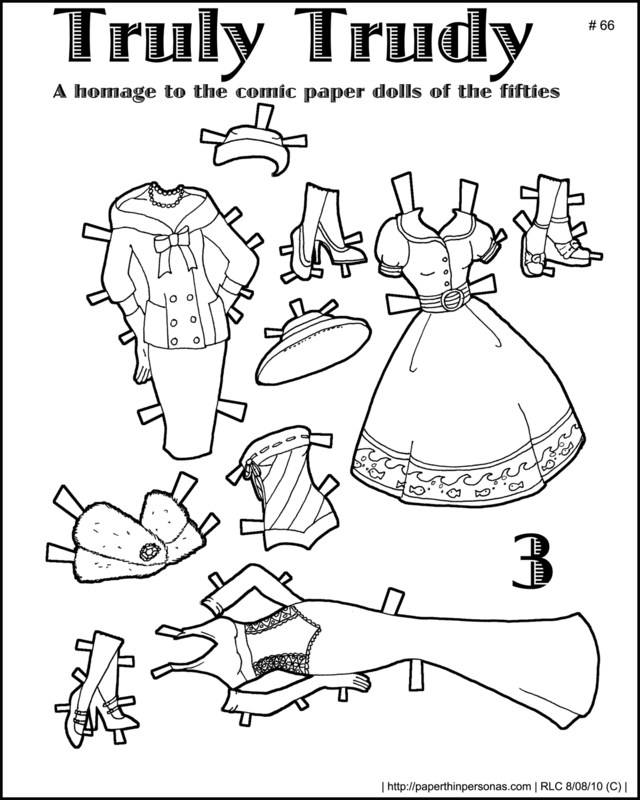 Non-Katy Keene dolls which impress me are generally the newspaper paper dolls that were printed in one color without shading. Not being a huge fan of shading myself, I love the sparse line work that makes these paper dolls fantastic examples of how you don’t need a lot of times to make an impact. Some neat ones can be found from Boots, a blog devoted to these newspaper images to color, many of which are paper dolls, and from The Paper Collector and Marge8’s Blog which I’ve already written a bit about. Hi, All your paper dolls are fantastic. I have tried to download truly trudy 3 but truly trudy 2 keeps downloading instead? Hi, I’ve just come across this site and have downloaded the truly trudy set, and i’ve had the same problem as Charn. Everytime I try to download truly trudy 3, I instead get truly trudy 2. Can you help? Opps. Sorry about that. I think I fixed the problem. Drop me a note if I haven’t successfully fixed it- paperthinpersonas(at)gmail(dot)com – sometimes these things work on my computer and don’t seem to work on other peoples.